Syn Free Easter Eggs! A seasonal savoury treat which is perfect for breakfast, brunch or brinner. 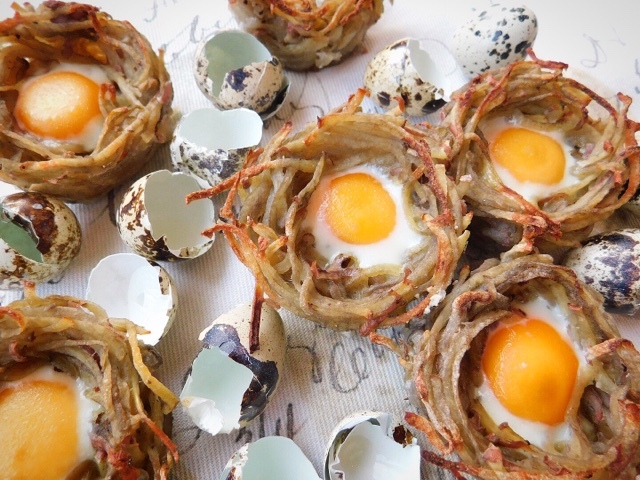 These bitesized Potato Rosti and Quail Egg Easter Nests taste amazing and are Syn Free on Slimming World. 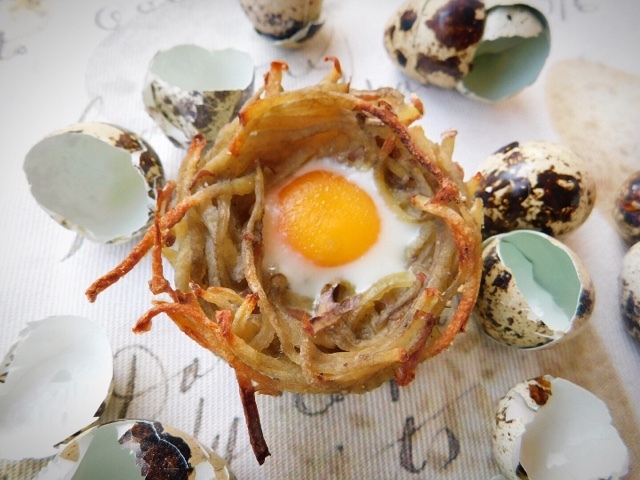 My Potato Rosti & Quail Egg Easter Nests are super easy to make if you follow my recipe. They did however entail a wee bit of trial and error on my part to perfect the method before I shared them with you. Muffin Tin - I baked the first batch in a silicone muffin tin but traditional metal ones are definitely better for heat conductivity and avoidance of soggy bottoms. Potatoes - Next the potatoes, I left the skins on, used a waxy variety and grated them using a food processor on the coarsest setting. They need to have as much as possible of the moisture squished out of them. I used a combination of my hands and squeezing them in a tea towel. Seasoning - Use much more salt and pepper than you think you'll need. My first batch was rather bland. You could also spice them up with paprika or chilli. Eggs - You can use hen's eggs for this recipe. Just make sure they are small ones and make a nice big hollow in the potato nest so they fit. Wash the potatoes, no need to peel, and coarsely grate. Squeeze as much moisture as you possibly can out of the potatoes using your hands, a teatowel or combination of both. Season the grated potatoes really well with salt and pepper. 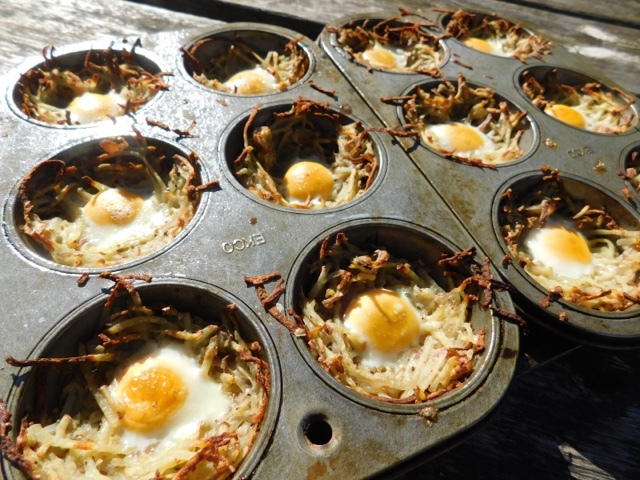 Spray a 12 hole metal muffin tin with oil and arrange the potatoes into 'nests' with a small hollow in the middle. Crack a quail egg into each hollow. Spray the nests with oil before baking them in the oven for 20 minutes or until the eggs are set and the potato rosti is golden brown and crispy. Too good to save just for Easter breakfast! How cute! My only hesitation is whether the potato will actually be cooked in that short time frame. Do you spread the rosti just really thinly? I promise you it is - and nice and crispy on the top. These look great, brilliant for a breakfast treat! They are perfect as a potato side dish too - I've now made them once for breakfast and twice for dinner. What an awesome idea! 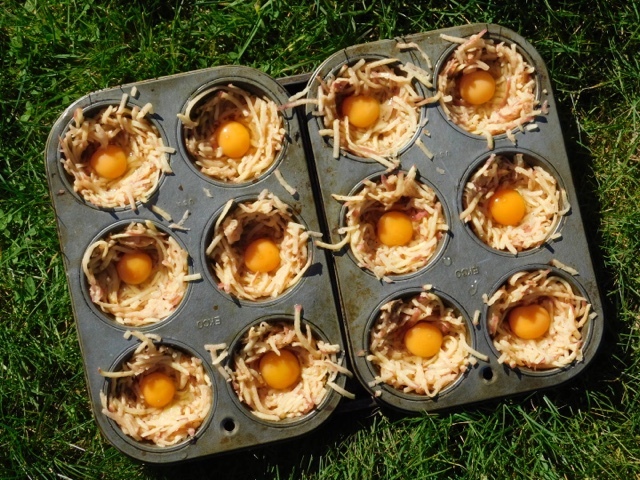 My muffin tin rarely gets used so this would be a great way to put it to a bit more use! My muffin tin gets a lot of use - probably the thing I bake most often - but this is a great alternative. You would not believe how excited I am about the Easter Bunny turning up with my Cheester Egg! Ooooh I hadn't thought of serving them as an Easter starter - that could work really well. I love these - Such a creative idea! Would make the perfect breakfast dish every weekend. Thanks so much for joining in with #BakeoftheWeek once again - very pleased to let you know that you are this week's featured recipe. 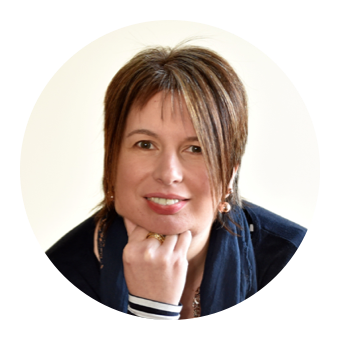 Oooh thanks for choosing me to be the featured recipe - do I get a sticker or a medal?! Definitely too good to save just for Easter. I had to pop over to say hello and also how much I love your nests :) Just perfect and so pretty! These look right up my daughter's street! Thanks for sharing with #OnePotato Two Potato.